To Cite: Alborzi S, Asadi N, Attar A, Maharlooei M K, Alborzi S. Management of an Abdominal Pregnancy by Laparoscopy: A Case Report and Review of the Literature, J Minim Invasive Surg Sci. 2013 ; 2(4):-. Introduction: Since abdominal pregnancies are mostly complicated, they are usually managed by laparotomy, but laparoscopy is an alternative method which some surgeons perform instead of laparotomy; especially in advanced pregnancy. Case Presentation: We reported a 31 year old woman with last menstrual period of 18 weeks who had supra pubic pain and vaginal bleeding. After sonographic evaluations, abdominal pregnancy was diagnosed and the patient underwent laparoscopic surgery for termination of pregnancy. One year after this successful operation, the patient experienced a normal intrauterine pregnancy. Discussion: Laparoscopy is a successful alternative method of surdery for abdominal pregnancies which can be done by experienced surgeons especially at gestational age of 18 weeks. Abdominal pregnancy is defined as existence of gestational sac in peritoneal cavity. Abdominal pregnancies constitute about 1% of ectopic pregnancies. The rate of abdominal pregnancy has been reported 1 in every 3,372 to 7,931 births (1). Abdominal pregnancy leads to 7.7 times higher maternal mortality rate than that associated with tubal ectopic pregnancy (2). The chance of fetal survival is very low and the fetal mortality rate increases from 40% to 95 % (3). This situation results from re-implantation of a tubal abortion (4). History of ectopic common risk factors contributed to the abdominal pregnancies (1). Abdominal pregnancies are mostly diagnosed in higher gestational ages in comparison to other ectopic pregnancies. So there are more risks for intra-abdominal hemorrhage. Therefore in most cases, laparotomy is the preferred approach (5-7). Laparoscopic termination of abdominal pregnancies has been reported recently but just for early first trimester pregnancies (8). There is no report about laparoscopic management of a second trimester abdominal pregnancy in literature. 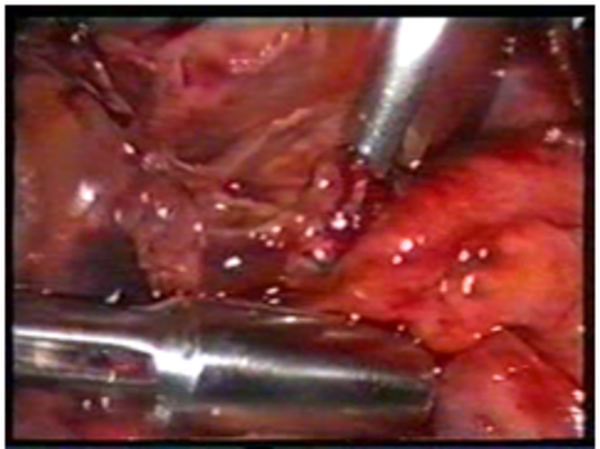 Here, we reported an 18 week abdominal pregnancy with laparoscopic approach termination. A 31 years old pregnant woman with gestational age of 18 weeks presented with vaginal bleeding and abdominal pain. On arrival, the patient was hemodynamically stable with a temperature of 37c, pulse rate of 80/min, blood pressure of 120/80 mmHg and respiratory rate of 20 breaths/min. There was no point of tenderness in the abdomen and pelvic exams. Uterus size was compatible with 12 weeks of gestation pregnancy and a non-tender mass could be palpated in its right side measuring approximately 8 cm. The hemoglobin level was 11.4 g/dl and hematocrit was 33.6 %. The B-HCG titer was 138 IU/L. Vaginal ultrasonography showed an empty uterus with two intramural myomas and a 13-14cm fetus which was located posterior to the uterus. Also a 4-5cm mass was seen in the right side of the uterus in favor of placenta. Therefore the patient was prepared for laparoscopic evaluation. Under general anesthesia by four puncture, laparoscopy was done. Abdominal pregnancy had severe adhesions to the small bowel, right ovary and appendix (Figure 1). Primarily, these adhesions were released carefully with dissection of the right ureter and fetus (Figure 2) and then the placenta (Figure 3) were taken out. Finally, the abdominal cavity was irrigated with normal saline and cystoscopy was done to find any possible injury which was also normal. Pathologic evaluation of the tissue showed the existence of placental villi and fetal parts. Twenty four hours after surgery, Β-HCG titer became 50 IU/L. The patient was ambulant the next day and discharged two days after the operation. She had a normal intrauterine pregnancy one year later in the follow- up. Abdominal pregnancy is usually complicated and leads to high maternal and perinatal mortality. Misdiagnosis is the main cause of these complications. About 50% of diagnoses are missed on ultrasound. MRI and CT are better diagnostic tools (9). Posterior cul-de-sac is the most common site of implantation followed by mesosalpinx and omentum respectively. However, pregnancy implantation in the abdomen, spleen, lung, liver and appendix is also reported (5, 10-13). During surgery, massive intra-abdominal bleeding due to placental separation is unpredictable, therefore regardless of gestational age of pregnancy, surgery should be performed as the diagnosis is confirmed, some surgeons prefer the expectant management of abdominal pregnancy while getting close to the due date of delivery.. During surgery, partial removal of placement can lead to massive bleeding, due to implantation of the placement over the tissues which cannot be contracted (14). In this patient, site of bleeding was stopped successfully by electro coagulation. By technical improvement and advantage in laparoscopy, it has been replaced for the surgical treatment of most ectopic pregnancy. Although successful removal of early abdominal pregnancy is reported (15-20), according to our knowledge, there isn't any report about the termination of abdominal pregnancy by laparoscopy in this gestational age. Early diagnosis depends on the clinician’s suspicion. Massive hemorrhage from placental separation may cause maternal death. Minimally invasive surgeries have been used for termination of abdominal pregnancies up to the second trimester of pregnancy (21). This is the first report about the laparoscopic management of the abdominal pregnancy in 18 weeks of gestation. One of the best criteria for effectiveness of treatment of ectopic pregnancy is the fertility rate after the ectopic pregnancy (22). Laparoscopic approach for removal of this abdominal pregnancy was successful to keep the fertility capacity of our patient. There is nothing to acknowledge. Implication for health policy/practice/research/medical education: By technical improvement and advantage in laparoscopy, laparotomy is of great importance for the surgical treatment of most ectopic pregnancy. Although successful removal of early abdominal pregnancy is reported , there isn't any report about the termination of abdominal pregnancy by laparoscopy in this gestational age. Funding Support: This work has been carried in Shiraz University of Medical Sciences.